November 06, 2013, 9:00 a.m.
Former director of public prosecutions Keir Starmer claimed on Monday that “mandatory reporting” of suspected child abuse should be written into law, during a BBC panorama investigation. Under the proposal a teacher or other professional who suspected a child was being abused but did not report it to police could face prosecution and a possible prison sentence. Starmer claimed the proposed legislation would “plug a gap” in the law that has been there for a “very, very long time”. A new poll reveals broad support for the proposal. 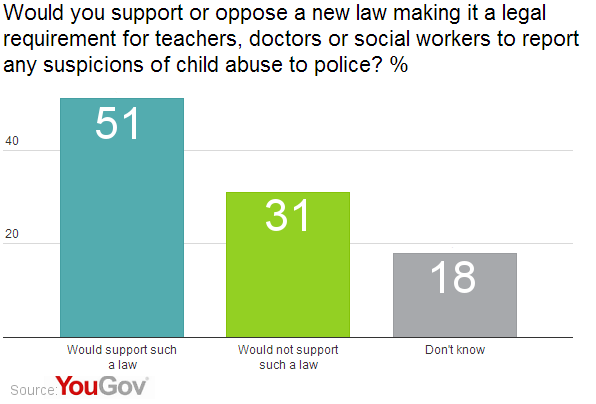 The majority of British adults (51%) would support a change in the law that places a legal requirement on public sector workers to report suspected child abuse. 31% would not support this change in the law and 18% don’t know. In Northern Ireland failing to disclose an arrestable offence to police is already a crime and "mandatory reporting" legislation already exists in the US, Canada and Australia. However, the Department for Education claims mandatory reporting legislation is “not the answer” and there are currently no plans to change the law.